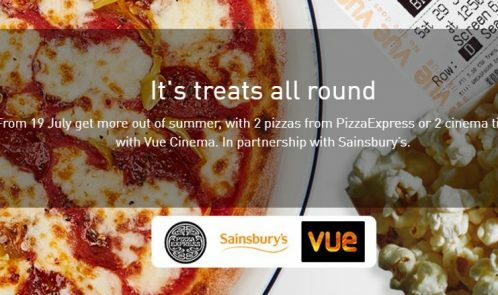 Hotter than a British summer heatwave, the Nectar Summer Rewards offer in partnership with Sainsbury’s is running till 8 August, giving cardholders the chance to enjoy two pizzas at PizzaExpress or two cinema tickets for Vue for just £5-worth* of Nectar points (1,000 points). Cardholders can make the most of the Nectar Summer Rewards offer to treat themselves to some of this year’s most anticipated movie releases, including Spider-Man: Homecoming and Cars 3, or tuck into a freshly baked pizza from PizzaExpress’ extensive menu. Turning points into a trip to the cinema or a delicious meal couldn’t be easier – simply go into the nearest Sainsbury’s superstore to exchange 1,000 points* for a Nectar Summer Rewards voucher. Those with the Nectar app can also redeem this offer simply by tapping whilst on the move. Alternatively, cardholders can go online at nectar.com/summerrewards. What’s more, there is no limit on the number of vouchers each cardholder can use, so Nectar customers will be able to enjoy this offer as much as they like. These Summer Rewards can be enjoyed at hundreds of participating PizzaExpress restaurants and Vue venues across the UK up to 30 September, helping families and friends take a bite out of the cost of having fun this summer.